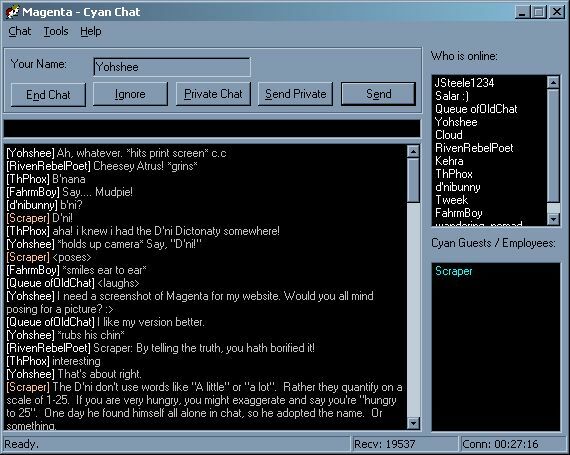 Magenta is a Win32 client for Cyan Chat that implements Version 1 of the CC Protocol. It implements it correctly, as well as implementing it completely (i.e. full ignore and color support). It is small, swift, and easy to carry. Unlike most software. The ability to create a private chat window bound to a particular screen name, and have all private messages to and from that person dispatched there, instead of the main window. Ctrl + clicking on either name list box will paste the selected user's name into the message window, prefixing what was already there. The ability to remove ignores at will, as well as being able to view a list of all those that you have ignored. Choice over whether to send the ignore command to the ignored party. Choice over whether to cause a mutual ignore when someone else ignores you. The option of being notified when you're ignored. The option of being notified when a new message comes in and the Magenta window is minimized. Sending of raw commands to the chat server. Snapshot logging of the current chat session. You can save this log file in RTF or plain text. "Chat Console" that logs all incoming packets. The console can be set up to be pulled up at startup. Graphical representation of those currently connected to the chat. Hovering your pointer over a name gives you more info about them. The ability to change which server and port you wish to connect to. Auto-completion of names of chatters when the Tab key is pressed. If more than one match exists, a list box pops up with a list of possible replacements. The ability to create a private block list, consisting of particular user names. These blocked users still appear in the Who's online window, but with "[Blocked]" after their name. The ability to automatically set your username at startup, optionally logging into Cyan Chat. The IRC command "/me" is recognized. For the curious, Magenta is written in C++, utilizing the Microsoft Foundation Classes (MFC) for all Windows stuff. It is also statically linked to the MFC libraries, which causes the executable to be a wee bit larger, but it also prevents the need to distribute libraries. Source is provided for the curious. Magenta is currently built using Visual C++ 6.0. The author is well-aware of this suboptimality. There apparently have been ports, but the state of those is unknown to the author. For Linux users, it runs fine under Wine. You can put the executable wherever you want. If you've ever used Putty, well, Magenta behaves like that. If you want to use the help system, be sure to place the help file into the same directory as Magenta. Current Magenta Source Code. Be sure to read readme-src.txt in the package. Here's a sample XSL stylesheet for the Magenta XML Format. Also check out the Magenta XML DTD.